Search for SUSTAINABLE PRACTICES based on customized information. On this website, you can find and manage information about SUSTAINABLE PRACTICES. 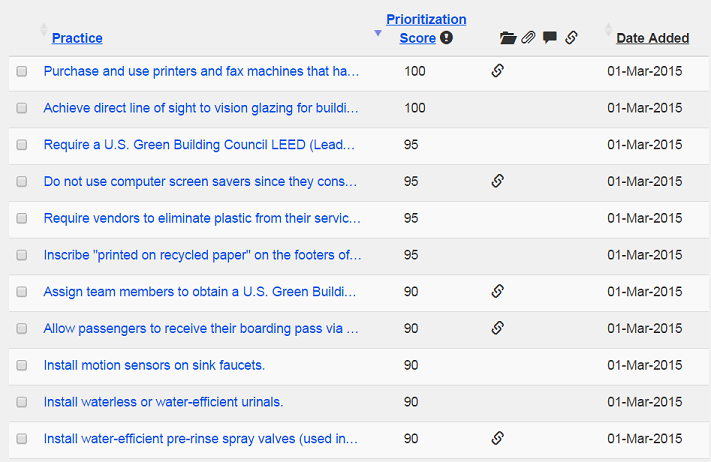 Use the keyword search box on the HOME PAGE or the SUSTAINABLE PRACTICES page to find practices. 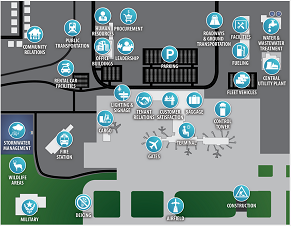 From the SUSTAINABLE PRACTICES page or the LEARN page, find practices specific to a functional area of the airport. Click on the map to choose a functional area and the practices applicable to that area will be shown. 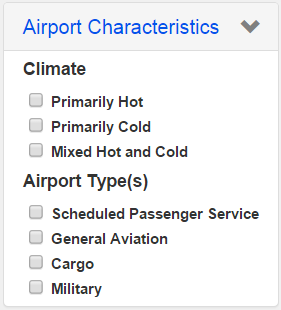 From the SUSTAINABLE PRACTICES page, narrow the list of practices based on your climate, geography and airport type. Check the boxes that best represent your airport and the database will filter out the practices that are not applicable to you. 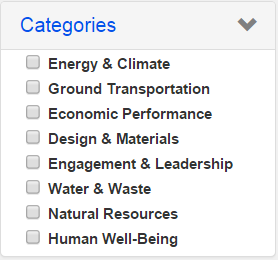 From the SUSTAINABLE PRACTICES page, narrow the list of practices based on category. Check the boxes of the categories that you are interested in and see the practices that match those categories. 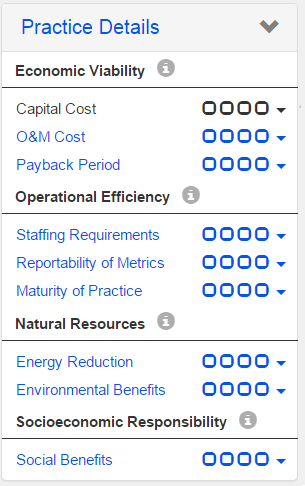 From the SUSTAINABLE PRACTICES page, find practices that match specific criteria, such as low capital cost, short payback period, and/or significant environmental or social benefits, among others. Although practice details are currently available for some practices, it is missing for many of them and should be completed by users like you. Please add or edit the practice details to share with other users. 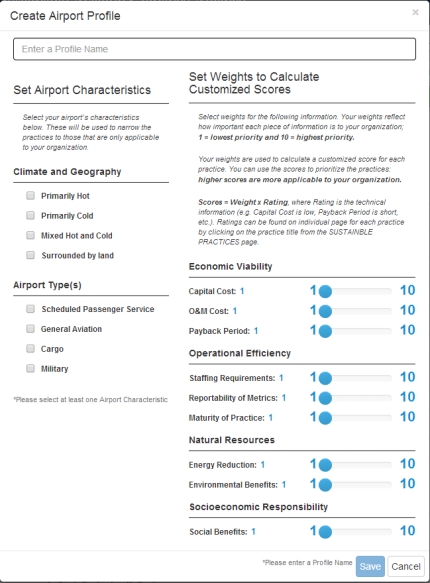 From the SUSTAINABLE PRACTICES page, set up one or more airport profiles that includes the airport’s characteristics and your weights for the practice information. Your profile will be saved and used in all of your searches when the profile is turned on. The weights are a number between 1 and 10 that you assign to each piece of practice information (e.g. payback period) to designate how important they are to your airport. Practice information with a weight of 10 have the highest priority and those with a weight of 1 have the lowest priority. The weights are used to calculate a customized score for each practice, which can be used to prioritize the practices. High scores = most desirable practices. All weights are set to 1 as the default value. Each practice has a score between 1 and 100. You can prioritize the practices based on the score. High scores = most desirable practices. The score is based on the practice information (e.g. capital cost) and the customized weights that you assign to the practice information (e.g. 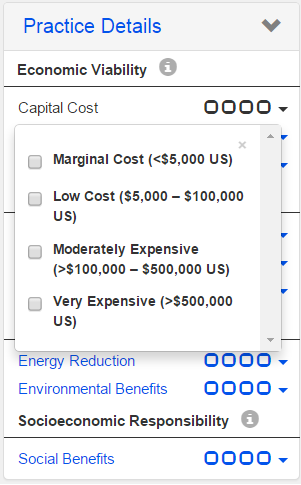 capital cost is most important to me). 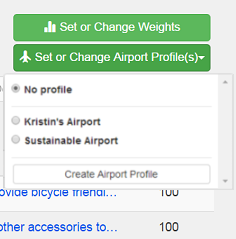 You can assign weights in your airport profile . Currently, scores are not available for many of the practices because the specific practice information is missing and should be completed by users like you. Please add or edit the practice information to share with other users. You can select and group practices together based on your searches from the SUSTAINABLE PRACTICES page and store them in the MY PRACTICES area. You can export your groupings as reports in Microsoft Excel or Word, or as an Adobe PDF.